When the fixtures come out in the summer, there are certain dates that you circle in the diary. Hartpury at home to Moseley, former giants of the English game, was one such example and, as fate would have it, the teams came into this fixture lying first and second in National League 1. Hartpury, to remind you, have had an extraordinary start to the 2016-17 campaign, prior to Saturday winning 13 of 13 played, all with maximum points. However, there was a genuine concern that Birmingham Moseley, ahead of probably any other team, would test that record in the most severe fashion. Well, it didn’t quite happen that way. A highly motivated Hartpury team simply dismantled their nearest challengers with a performance that combined a massively committed forward effort with some truly sublime running and finishing by the exciting Gloucestershire back division. Conditions were close to perfect. A firm and well-grassed track was a testimony to the Hartpury ground-staff and a dry day, with only a gentle breeze, was the ideal back-drop to running rugby. The home side kept the core of the team that had won convincingly at Loughborough the week before, although Ben Vellacott traded his place on the bench for a starting berth at scrum-half and was joined in the key positions by returning fly-half Jacob Perry. George Boulton got his chance on the wing while, in the forwards, Will Safe was a welcome face at Number 8, as skipper Rhys Oakley shuffled forward to replace injured lock Joe Dancer. Moseley’s form, coming into the game, was decent. Eleven wins from thirteen, albeit occasionally by narrow margins, had them positioned with a chance for a quick return to the Championship, from where they had slipped last season, despite being the leading club in England’s second city. And they did enjoy a fair amount of possession in this game, despite a somewhat vulnerable line-out, but if they had hoped to use their big pack to bully the league leaders, they were forced to re-appraise their objectives early in the match. Oakley led his forwards from the front, tackling and carrying in equal measure, and the home pack overall had a good day – rock solid in the scrum and more than competitive in the key contact areas. Only a couple of missed line-outs would have worried the coaches, but they regularly helped themselves to Moseley ball in this area, so perhaps they will be forgiven on this occasion. Vellacott (pictured), and man-of-the match Perry, set the tempo superbly, the scrum half always a threat with ball in hand while Perry got his three-quarters moving smoothly whenever possible. But the first score was pure power as, with only two minutes on the clock, Will Tanner drove over from a line-out after Hartpury should arguably have finished a flowing opening move. Perry then slotted a penalty, a scintillating Vellacott break having drawn the first of Moseley’s three yellow cards, before more tries came in a bewildering flurry. First Vellacott latched onto a Jonas Mikalcius chip to race home untouched, before Steve Leonard went over after great build-up play from excellent full-back Mike Wilcox and winger Mikalcius. Hartpury were not looking for assistance at this stage, but they got some when two Moseley defenders made a hash of dealing with a box-kick and centre-turned-winger George Boulton could hardly believe their generosity, as he collected the loose ball and sprinted in from half way. Bonus point 14 of 14, duly collected. Hartpury made it 38-0 at the break when a cross-kick kick, this time from Perry, was won in the air by Mikalcius and Leonard was left with a sprint in for his second try and the team’s fifth. Moseley did engineer a score immediately after the break, winger Michael Penn squeezing in at the corner, but Cheltenham boy and Gloucester Academy forward, Will Safe, soon had the scoreboard ticking again in the home team’s favour, driving over after good pressure from the Hartpury pack. A penalty try was awarded after a maul was dragged down on the Moseley line, but this was merely a prelude to a moment of glory for replacement loose-head Des Merrey. Ignoring every rule relating to ‘front row union’ membership, he sprinted home from half-way straight from the re-start, out-gassing the cover defence in the process. With the game – excellently refereed by Veryan Boscawen – long over as a contest, the last score came from the final play. Vellacott, now deputising as a winger, cut a swathe through the visiting defence from deep in his own 22, before feeding the ever-supporting Mikalcius for a well-deserved try. Perry slotted his ninth successful kick of the game, to bring down the curtain on a glorious day. To make matters even better, results elsewhere were also kind. 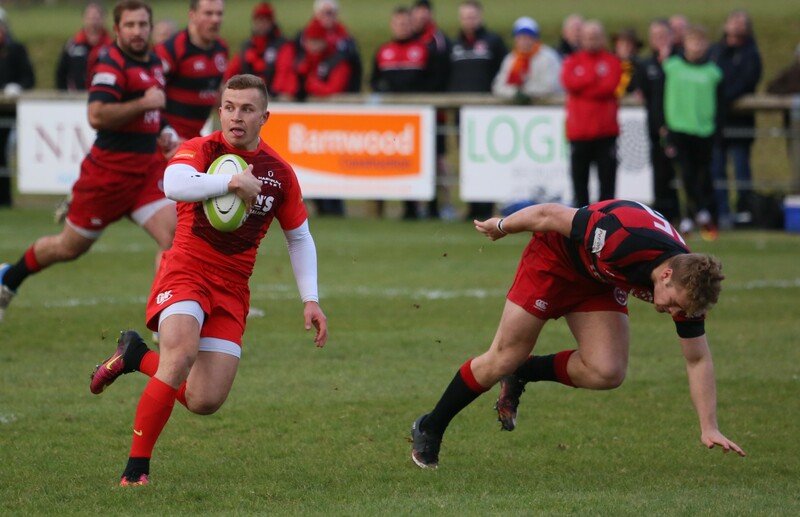 In particular, the fact that Plymouth Albion came away from their visit to Ampthill with only a single point means that Hartpury now have a 19-point cushion at the top of the league. There are now two away matches to negotiate before the two-week Christmas break, the second of which is away to 3rd-placed Albion on Saturday, 17th December. Hartpury RFC: Wilcox, Boulton (Try 27), Leonard (Tries 25, 35), Eves, Mikalcius (Try 80), Perry (Cons 2, 22, 25, 28, 36, 66, 68, 80; Pen 12), Vellacott (Try 22); Flook, Tanner (Try 2), Clarey, Quinn, Oakley, Polledri, Gilbert, Safe (Try 52). Penalty Try (66). Replacements: Stephenson, Merrey (Try 67), Brockett, Chan, Shaw. Birmingham Moseley: Williams, Cheshire, King, Molenaar, Penn (Try 41), Grove, Brown; Fidler, Caves, Stuart, Oram, Charlton, Hone, Preece, Brightwell. Replacements: Burgoyne, Elliott, Farnworth, Brazier, Le Roux. Wow, without swearing, just wow.